What is glaringly new is the use of Autism in a political statement. It is so out of place I have to wonder if it doesn’t mean the same thing to the fringe right as everyone else, since they have their own little hate glossary with meanings drawn completely from conspiracy conman Alex Jones or some such place. I’m going to have to dig to find out how they believe this ties together. Perhaps they think liberal values have caused the so-called “autism epidemic”? I had to investigate. I tested out a bunch of terms starting with “seeds of Autism” since that was the phrase they created. That came up with one BBoard site called Ar15. I’m not linking to their dross. You can google that one yourself if you must. But, the line that stuck with me was one post that asked, “What fun is it trolling the leftist if they are too stupid to understand the joke?” A few other posts list other seemingly unrelated memes about a frog, and I was still perplexed. NEETS stands for “No Education, Employment, or Training” which self-deprecatingly refers to 4chan’rs that are loony right wing and also live in mom’s basement that spends all day playing video games or on the internet that may be on the spectrum. They call people who work, oddly enough, wagecucks or wage slaves. Unclear how they think the “free market” economy can work if all these twats don’t contribute, but whatever. REEEEEEE! is the angry shriek of a 4chan’r. “Typically, it’s used to show anger at “normies” for invading their online spaces. There are memes of Pepe the Frog making that noise when he’s angry.” Presumably, Pepe then becomes the image of an angry alt-right loon when a lefty enters their forum. Don’t you feel educated now? So, to sum up, the followers of Pepe, aka NEETs, were accusing the left of causing Autism with our politics to rile us up in some PC froth, but only managed to confuse everyone. Now they are just licking their wounds and blaming us for being too stupid to understand their memes without a f’ing translation. I’d call this a fail for the home team. Further this has nothing to do with Autism really, good or bad. There’s nothing further to read into it. It’s for the most part been ignored post-CNN coverage, so, of course, I had to understand it, as if making sense of the alt-right is even feasible. “Am I mad,” as the troll face always asks? No, I find it childish and in amazingly poor taste, but no, I’m not mad. I have plenty of real things in my life that warrant more of my energy, but I am angry that this mural was graffitied. 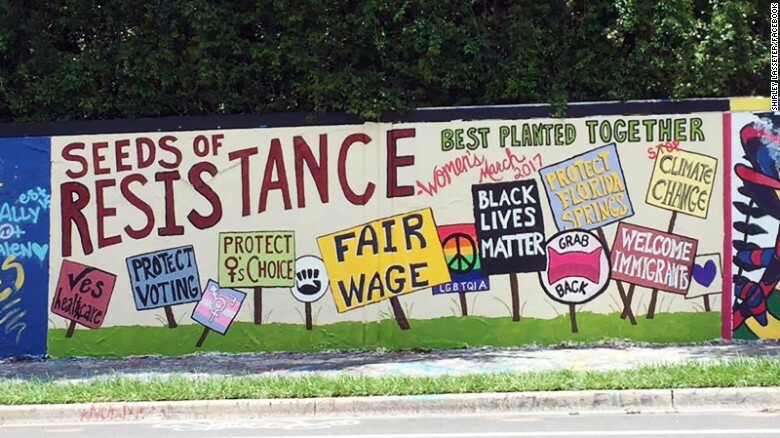 Someone on that BBoard called the mural graffiti and likened the vandalism to the mural itself, as if the two can be equated just because it portrays politics they don’t like. Talk about twisting facts! More alt-facts. I’d like to know if there were any arrests.